Stromboli is the northeastern most of the Aeolian Islands. Stromboli volcano has one of the world's longest recorded periods of activity. The active craters are located 100-150 m below Pizzo sopra la Fossa. A collapse depression called Sciara del Fuoco is located below the active craters. Activity at Stromboli volcano consists of weak to mild explosions of incandescent ejecta at a rate of 3-20 per hour. Eruptions at Stromboli volcano were at normal levels in March 2018. Eruptions occurred 3-8 times per hour. 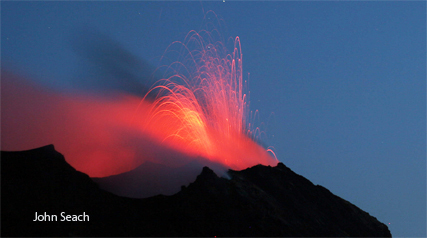 Eruptions continue at Stromboli volcano in January 2013, with Strombolian eruptions from multiple vents. During April 2011 activity at Stromboli volcano remained normal with low to medium eruptions occurring from several vents in the summit area. The vents were located at in the north and south of the crater terrace. The northern vent was the most active during the month, with eruptions producing ejecta up to 200 m high, 2-4 times per hour. 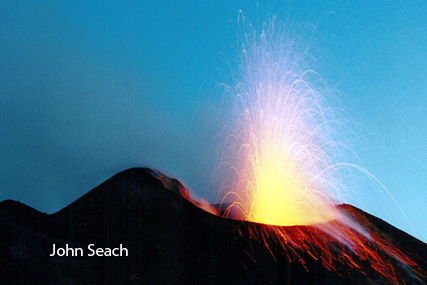 Two southern vents produced eruptions 1-6 times per hour and ejected lava up to 120 m high. Eruptions continue at Stromboli volcano in October 2009. 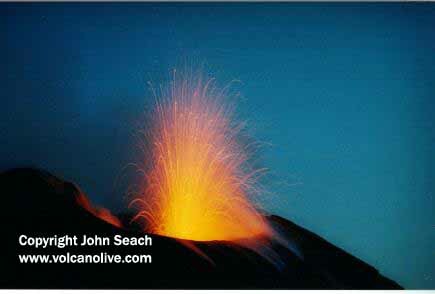 Strombolian eruptions continue in 2008. In June there were four active vents, producing eruptions about twenty times per hour. 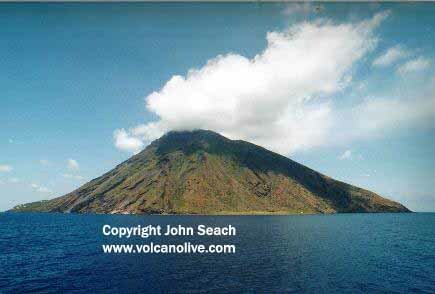 A flank eruption started at Stromboli volcano on 27th February 2007 and continued to at least 15th March. Lava flowed in three branches from the flank of NE crater to the sea. A new vent opened at the eastern edge of Sciara del Fuoco at about 400 m elevation on the first day of the eruption. A large explosion occurred on 15th March 2007. On 28 December 2002 a lava flow started in the summit area, and continued until 22nd July 2003. On 30th December 2002 two landslides occurred at 1315 and 1322 hr along the Sciara del Fuoco. The large volume of rock crashing into the sea created two tsunamis, with wave heights of several metres. The tsunamis hit the villages of Stromboli and Ginostra, damaging buildings and boats and injuring several people. Six people were evacuated by helicopter to two hospitals on Sicily. A large explosion occurred on 23rd January 2002 at 2054 hr. The explosion was heard from all villages on the island. A large fallout of debris covered an area near the summit frequented by tourists. This would may have resulted in injuries if tourists had been at the location. A major explosion occurred at 0237 hr on 20th October 2001. Large blocks of lava landed at Pizzo sopra La Fossa (summit), with a maximum diameter of 40 cm. Ejecta hit a group of tourists a few hundred meters away from the vents, killing one person. 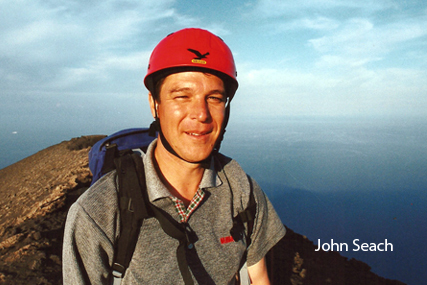 Tourists at Stromboli volcano were hit by ejecta on 26th March 1989. The large eruptions occurred without warning, and highlight the dangers of close approach to volcanic vents. One tourist broke an arm while fleeing in panic. 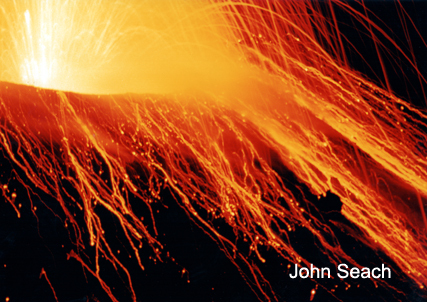 A lava flow began at Stromboli volcano on 6th December 1986. At 08:15, a small nuée ardente descended the NW flank of Sciara del Fuoco and reached the sea. Lava flowed into the sea, forming a small peninsula at the NE end of the Sciara del Fuoco. A tourist was killed at the summit on 24th July 1986. The victim was 15 m from the crater rim and hit by a falling block. A new lava flow began at Stromboli volcano on 5th November 1975. Lava reached the north coast of the island. The lava flow was fed by a subterminal vent, which opened on Sciara at about 700 m altitude. Strong explosions occurred at the crater terrace ejecting bombs to a height of 800 m.
Lava flowed to the sea down the Sciara del Fuoco on 3rd April 1971. A submarine eruption occurred 50 m from the coast of Stromboli in February and March 1955. Glowing clouds were produced at Stromboli volcano in February and March 1954. A tsunami was generated along with moderate explosions and a lava flow. 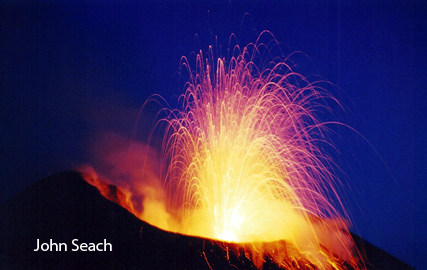 A lava flow began at Stromboli volcano on 6th June 1952 without any precursory explosions. 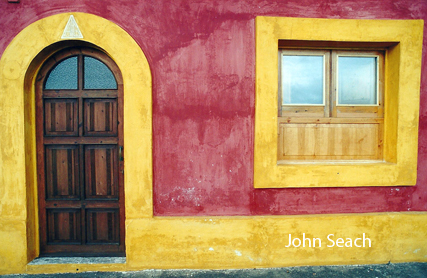 Inhabitants of San Vincenzo were not aware of the flow until alerted by a tourist, arriving by ship, who saw it flowing down the Sciara del Fuoco. The lava flow continued for several days. island. A tsunami was generated. Lava flow down the Sciara del Fuoco lasted until the end of October. Eruptions from Stromboli volcano on 31st January 1936 caused ashfall on Catania in eastern Sicily. Two strong explosions occurred at Stromboli volcano on 11th September 1930 during a few second interval. The explosions were heard 60 km from the volcano. An ash cloud rose to a height of 2500 m. Thirty ton blocks fell on Ginostra. Scoria fell on Scari for 40 minutes. A glowing avalanche approached S. Bartolo church. Another avalanche reached the sea down the Sciara del Fuoco. Three people were killed by the avalanche and a fourth by the boiling water. A tsunami was generated. On 22nd May 1919 strong explosions at Stromboli ejected 30-60 ton blocks onto houses in San Vincenzo and Ginostra. Four people were killed and 20 injured. A tsunami was generated. On 20th June 1916 a volcanic earthquake at Stromboli was followed by strong explosions and a lava flow. On 4th July during a 15 minute period ejecta were thrown to a height of 1000 m.
Eruptions caused lapilli to fall on all of Stromboli on 25th August 1912. Ash fell on Calabria and Sicily. A strong explosion with ashfall and a short lava flow occurred at Stromboli on 11th January 1907. An explosion and short lava flow occurred on 31st January. On 13th April two strong explosions set fire to vegetation. A plinian explosion occurred on 27th April. On 14th May strong explosions caused ashfall in Messina on the northeast coast of Sicily. Lava flows were recorded at Stromboli in January, March, June and November 1903. 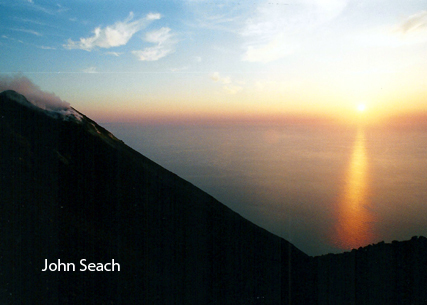 On 24th June 1891 there were two strong explosions at the summit of Stromboli within 30 seconds. A landslide occurred between Labronzo and S. Bartolo. 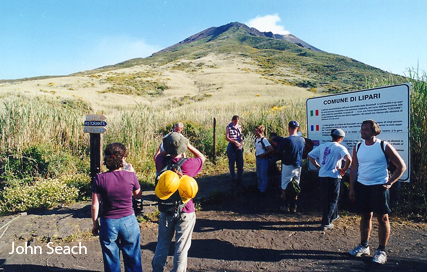 An earthquake preceded the opening of five vents on the Sciara del Fuoco, 100 m below the crater. During this activity there were no eruptions at the summit craters, which resumed when the lower vents stopped erupting.